Prepared by Timothy J. Carroll, MD, PhD and Janice M. Gallant, MD from the Department of Radiology, Fletcher Allen Healthcare, Burlington, VT.
A previously healthy 2-year-old girl was seen by her pediatrician with a history of increasingly poor appetite and decreased energy and activity over the prior 2 months. She had occasional vomiting and foul-smelling stools. On physical examination, the child appeared pale and emaciated. Her weight had dropped from the 60th percentile at 19 months to below the 25th. She was lethargic, but cooperative. Her abdomen was protuberant, soft, and nontender. There was no organomegaly. 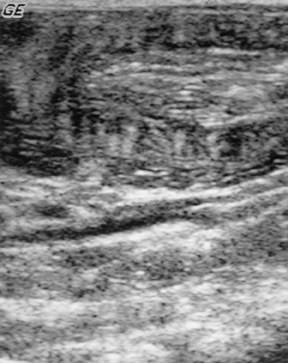 An abdominal ultrasound was performed (Figure 1). A subsequent computed tomography (CT) scan demonstrated no abnormality (not shown). 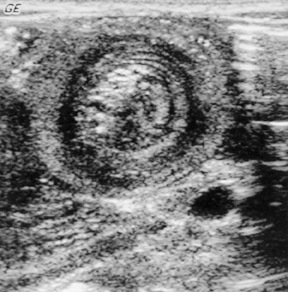 An ultrasound of the abdomen was normal except for a target appearance to the bowel in the mid-abdomen (Figure 1). A focal segment of bowel showed a hypoechoic rim of thickened bowel wall measuring 6 to 7 mm and heterogeneous echogenic structures within the lumen, which appeared to be small bowel loops. These findings are classically compatible with intussusception. 1 A repeat examination (not shown) performed 45 minutes later revealed no abnormality, suggesting intermittent intussusception. There was no tenderness, ascites, or fluid-filled bowel. A gluten-free diet was started empirically (on the mother's initiative following an Internet search). The patient improved within 2 days: vomiting ceased, appetite improved, and she returned to normal activities. Laboratory studies were performed for endomysial antibodies IgA and anti-gliadin antibodies; IgG and IgA were strongly positive with endomysial IgA titer 1:10,240, gliadin IgG 108, and gliadin IgA >500. At follow-up, physical examination showed a normal, active 2-year-old child with a 9-oz weight gain. A biopsy, the diagnostic test of choice for celiac sprue, was not performed at the mother's request because of her child's dramatic improvement on dietary therapy. Because the laboratory results were strongly suggestive of a diagnosis of celiac sprue, this was the presumptive diagnosis, and the patient's progress was followed on a gluten-free diet with continuing good health. The case of a childhood small-bowel intussusception apparently caused by sprue has been rarely reported and is usually reported from Europe. 8,9,10 There is one U.S. based report. 11 One study using ultrasound in 17 pediatric sprue patients did not mention observing intus-susception. 12 The largest prospective study of ultrasound for suspected intussusception showed many cases of clinically suspected intussusception that were not confirmed by radiologic study. 2 The fraction of these cases that represent intermittent or transient cases with spontaneous resolution is unknown. Infantile intussusception is considered a life-threatening emergency that requires immediate radiological and possible surgical interven-tion. 1,13 This is a case of a child with an unexpected finding of transient intussusception on ultrasound apparently associated with active celiac sprue. Small bowel intussusception associated with celiac sprue. Appl Radiol.